This is part of a series of historic structure reports on the historic architecture of Georgia and the Southeast by Tommy H. Jones. It is posted here for educational purposes only and may not be used or reproduced for commercial purposes or without the express permission of the author. George Washington Collier (1813–1903) is believed to have built this house around 1868 on the site of the house that his father had built in the early 1820s. The original house was probably destroyed or heavily damaged in the summer of 1864, although some of its materials may have been incorporated into the second house. While much of the evidence for an assumed construction date around 1868 is circumstantial, the dimension of much of the house’s framing lumber is typical of the third quarter of the nineteenth century, and the fact that much of it is also circular sawn supports the present author's conclusion that the existing structure cannot be the same house that Collier’s father built in 1823. Nevertheless, the house is a rare survivor in Atlanta, and the site itself harks back to the earliest days of white settlement in the area. Although not the oldest house in the city of Atlanta, as some have believed, the Collier House remains one of the city’s more significant historic buildings. George Washington Collier was Atlanta’s first postmaster, and one of the city’s best-known citizens in the nineteenth century. He and his brothers owned hundreds of acres of land along Peachtree Road, and the family’s early use and later disposition of that land, beginning around 1890, had a huge influence on the development of the Peachtree Street corridor from Fourteenth Street to W. Wesley Drive, which was named for Collier’s brother Wesley. Owned by Collier descendants until the 1940s, the Collier-Bentley house is one of the city’s few structures to survive from the Reconstruction era, and its preservation and restoration by the noted architect R. Kennon Perry in 1952–1953 was one of the earliest examples of historic preservation in the city. In 1958, the house was purchased by the late James L. Bentley Jr. (1927–2003), one of the state’s more prominent politicians in the 1950s and 1960s and a pioneer in reviving the state’s Republican party in the 1960s. In January 1821, another land cession by the Creek pushed the state's border to the Flint River, an area that included what is now the City of Atlanta. White settlers, a few with slaves, poured into the new territory, which was quickly organized into five counties. By the time Dekalb County was organized out of one of those counties in December 1822, there were already several thousand people in the new county. Earlier that year, Joel Pritchet hired Meredith Collier, one of his neighbors in Gwinnett County, to help him move to a new house that he had built a couple of miles northwest of what would become downtown Atlanta. In doing so, the story goes, Collier liked what he saw of the new country, especially the land along Clear Creek in Land Lot 104 and soon himself decided to move. His son George remembered during the course of two newspaper interviews in 1896 and 1897 that his father “went to law over some land he owned there [in Gwinnett County] and finally grew tired of the worry.” As a result, “he made a trade with the fellow that owned it and it came around that we moved down here from Gwinnett County.” Any record of Collier’s purchase of Land Lot 104 was apparently destroyed in 1842 when the DeKalb County courthouse burned, but his son remembered that Meredith Collier built a house for his family “on the spot” where the present Collier-Bentley House now stands at the crest of a small hill above Clear Creek in Land Lot 104, 17th District. He also remembered that he and his younger brother John planted two walnuts behind the house in 1826. The trees that they produced survived well into the twentieth century and were the progenitors of a second generation of walnut trees that is still present on the site. In the spring of 1823, the county’s Inferior Court justices began appointing panels of men “to view and designate the different routes on which roads are intended to pass” through the county. In most cases the routes had already been established, either as Indian trails or settler-created wagon roads. Peachtree Road, which had been laid out in 1814 between Hog Mountain in northeastern Gwinnett County and Standing Peachtree, the site of an old Indian village on the Chattahoochee River at the mouth of Peachtree Creek, was one of the first roads formally designated. “Another was "the Shallow Ford road” connecting Decatur with an important river crossing into Cherokee country, now submerged by the upper reaches of Bull Sluice Lake near present-day Roswell. Meredith Collier had probably already built a house, which was in all likelihood a log structure, when he helped lay out the road between Decatur and Standing Peachtree. He built at the crest of a small hill just a few hundred feet west of Clear Creek, most likely orienting his house to the north and what would become Montgomery Ferry Road, which was the main thoroughfare in the area. Not until the railroads gave birth to what became the city of Atlanta in the late 1830s did some semblance of Peachtree Road evolve out of older roads and trails. According to Collier’s reminiscences in 1896, Peachtree Road followed an old Indian trail in the vicinity of the Collier’s house. While the surveys of the district and its land lots in 1821 document what must have been the majority of the trails in the area, they do not document any north-south trails in the vicinity of the Colliers' house. Not until later did the modern Peachtree Road take shape, establishing its modern route with completion of a bridge over Peachtree Creek in 1848. Post offices were established at Standing Peachtree in 1823 and at Decatur in 1825, and as the county grew, a third post office, called Clear Creek, was established in November 1831. In July 1833, Meredith Collier succeeded Ulysses Montgomery as postmaster of the Clear Creek Post Office, which was apparently operated out of Collier’s house in Land Lot 104 until the post office was discontinued in February 1839. In 1838 he was elected to the State House of Representatives, where he served two or three terms, and later to the State Senate. He also served as Justice of the Peace for many years, beginning in the mid-1820s. On 7 June 1845, George Collier was appointed post master at Marthasville, and a week later, having “dickered” with the owner, as he later described the transaction, Collier paid $130 for a small lot at the northeast corner of the intersection of the town’s main streets—Decatur, Marietta, Peachtree, and Whitehall. 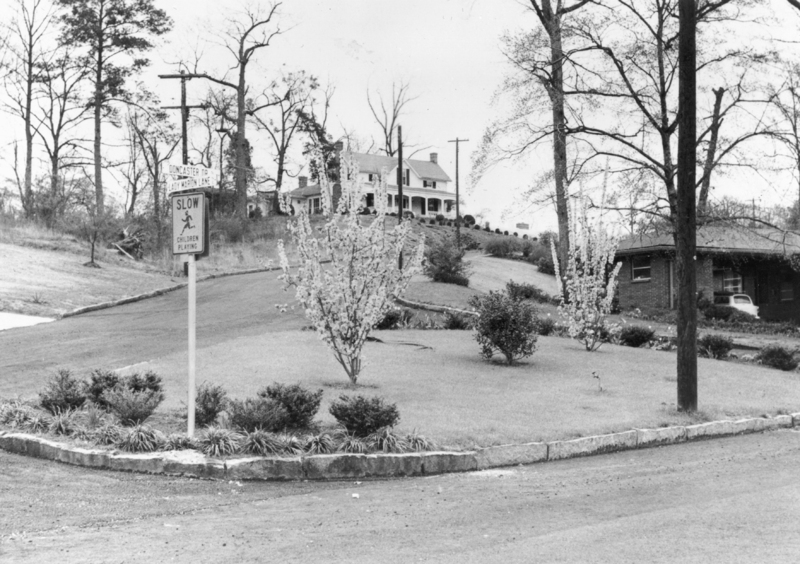 A short time later, a fifth street would take shape along the land lot line on the north side of Collier’s lot, placing him at the very heart of Atlanta, Five Points. With thirty-five feet of frontage on Peachtree Street and forty-five feet on Decatur Street, the lot would prove to be an excellent investment. “I went to the woods myself,” he told the reporter in 1897, “and cut down the sills and hewed out the sills for the store—a one story frame affair.” Operating a grocery store and the post office on the Peachtree or west side of the building, Collier rented the rest of the building “to a lady who kept boarders.” In December 1849, Collier, who was a Democrat, was replaced as post master by the new Whig administration, but the site was valuable, and he may have continued to operate his grocery at what would be known as 25 Peachtree Street. Prospering in 1859, Collier replaced the old wooden store building at Five Points with a three-store brick building, housing Hunnicutt Drug Store, which some thought the city’s “most beautiful” store before the Civil War. 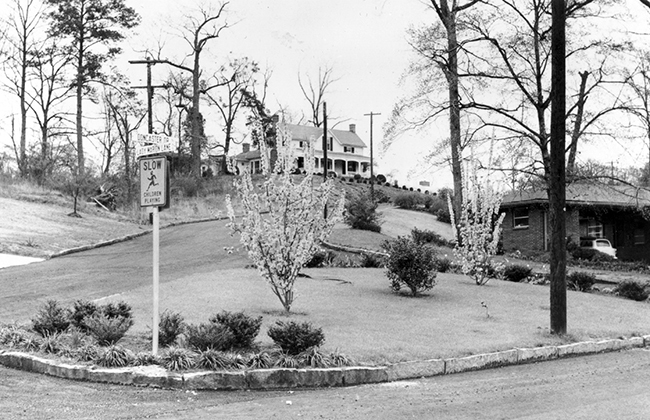 By the 1850s, much of old Montgomery Ferry Road, once a main thoroughfare in front of Meredith Collier’s house, had fallen into disuse, and the elder Collier apparently decided to build a new house on Peachtree Road, probably in the extreme southwest corner of Land Lot 104, a few hundred yards to the southwest. By then, George’s brothers Edwin Collier (1807–1872) and Wesley Collier (1824-1906) had established their own farms further north along Peachtree Road, and brother John Collier (1815–1892), who was a noted lawyer, had built a house at 47 Nelson Street, just southwest of downtown. Their younger brother George, or "Wash" as he was commonly known, was in his late thirties, still unmarried, when Meredith gave him title to Land Lot 104 in November 1851. Encompassing just over 200 acres, the lot contained the old homestead, where George Collier continued to live, apparently alone. Throughout his life, Collier perpetuated an image of a simple, if not rustic lifestyle; and although he continued to farm, at least for his own consumption, until old age, he also remained engaged with real estate throughout his life. Real estate, bought early and never sold, would make Collier a millionaire by the time of his death in 1903. As early as the Federal census of 1860, Collier declared real estate worth $20,000, an enormous sum at the time. Meredith Collier died on 28 February 1863, and was buried in the family cemetery near his first homestead in Land Lot 104. Too old to fight in the early years of the Civil War, George Collier and his younger brother Andrew Jackson Collier were both listed as farmers when the state’s “Joe Brown” census of all males 16 or over who were not yet in the army was taken in February 1864. Within a short time, construction began on an outer line of defense for Atlanta, continuing into the summer as the Federal army advanced from Chattanooga. With the failure to prevent the Federal army from crossing the Chattahoochee River, the Confederate army fell back to the south side of Peachtree Creek and hastily threw up a second line of defense a half mile south of Collier Road, this line crossing Peachtree Road near the late Meredith Collier’s old house and running within a few yards of George Collier’s house, which was left exposed in front of the fortifications. By July 19, the Federal army had occupied the north side of Peachtree Creek, over-running Wesley Collier’s farm as they crossed the creek on July 20. The four-hour battle that ensued was centered around Collier’s Mill, on Tanyard Creek a mile and a half northwest of George Collier’s house. By sundown, nearly 4,800 Confederate and more than 1,170 Union soldiers lay dead or wounded. By the end of the month, two more battles had been fought east and west of the city, and tens of thousands of Federal troops laid siege to Atlanta through the month of August until the city was finally surrendered on September 2. George Collier and his brothers Wesley and Andrew rebuilt their farms after the war, with their recently-widowed mother, Elizabeth Collier, living with Andrew until her death in 1876. Meredith Collier’s house on Peachtree Road was apparently not rebuilt, and George may not have been able to make the old house on Clear Creek habitable, if it survived the war at all. Still unmarried, he might not have felt the necessity to rebuild at once, but he almost certainly built the present house by the time he finally did marry in 1874. 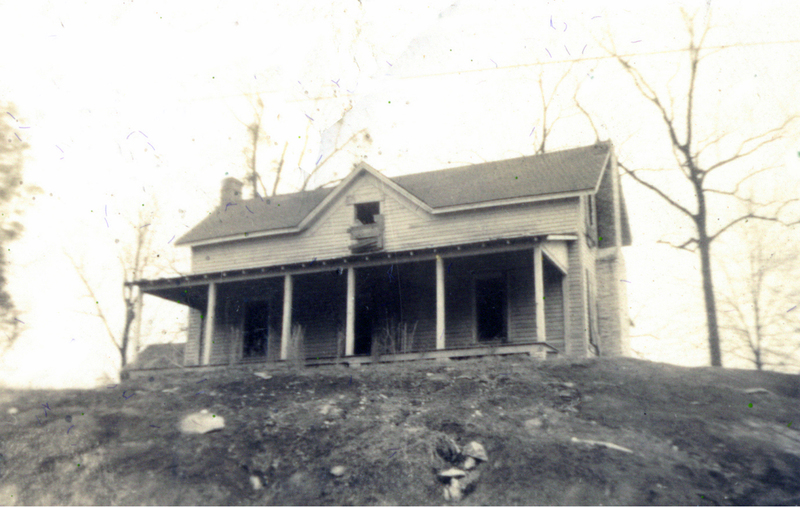 Although the exact date of construction is not known, a newspaper article in 1948 stated that George Collier’s house had “remained basically the same for 80 years,” or since 1868. He rebuilt his building at Five Points in 1867, and it is likely that he would have rebuilt his home around the same time as well. Close readings of the interviews with Collier during his life time and of the various newspaper accounts and other historical traditions about the Collier family and the house do not support modern suggestions that the Collier-Bentley House is the same house that Meredith Collier built in the 1820s. When the Colliers moved to Clear Creek in 1822, they and most, if not all, of their neighbors lived first in a log house that was replaced or improved once sawn lumber became available. In addition, many of the Collier descendants, with some of whom the Bentleys discussed the house’s history, have never taken George Collier’s house to be the original house. Part of the ambiguity about the history of George Collier’s house has rested in the fact that he rebuilt on the very site of his father’s house, perhaps on the original foundations. He also may have used some lumber salvaged from the old house. Nevertheless, certain aspects of the present building’s design and materials point to a construction date in the third rather than the first quarter of the nineteenth century. These features include significantly higher ceilings (10' on the first floor) and larger windows than would have been typical in the 1820s. The burning of Atlanta in November 1864 left Collier’s building at Five Points “a heap of ruins,” according to one observer who saw it in December 1864. By the time the first post-war city directory was published in 1867, however, Collier had rebuilt on the site, and his three-story, Romanesque Revival building housed another drug store at Five Points. Until the 1920s, a succession of popular drug stores occupied the first floor of the Collier Building, including at least one in which Collier himself was a partner in the 1870s. At the turn of the century, Collier’s building was known as “Silverman’s corner,” after one of the city’s noted tobacconists who operated a store there for many years. After Collier’s death, the building continued to produce income for the Collier family, housing Tom Pitts’ famous drug store, a popular meeting spot for a generation of Atlantans in the early 1900s. Although George or “Wash” Collier, as he was often known, acquired most of his property before the Civil War, he made two significant additions to his real estate holdings north of town in the years after the war. His oldest brother Edwin, who lived near the rest of the family along Peachtree Road, did not rebuild after the war, selling his property in Fulton County and moving to Cherokee County, Alabama, where he died in 1872. In 1869, George Collier paid $840 for thirty acres of Edwin’s old land in the southeast corner of Land Lot 110 adjoining Land Lot 103, which Collier already owned. Land values around Atlanta did not collapse completely after the war, as they did in many rural areas, and they soared in the last quarter of the century. In 1884, Collier paid $3,734 for three parcels totaling only forty acres that adjoined Land Lot 103 on the north and east. With that purchase, however, his “country property” included almost 700 contiguous acres that stretched from just north of Fifteenth Street nearly two miles to Peachtree Creek. George Collier’s brother Andrew was forty before he married in 1867 and began raising a family; George himself was past sixty when he did so on 1 October 1874. His wife, who had the improbable name of Lesbia Ann Cornett (1856–1889), was barely eighteen. She may have been from Cobb County and is reported to have been a member of Sardis Methodist Church, located on Powers Ferry Road north of Buckhead. Collier himself was “inclined” to the Baptist faith, according to his obituary. Little is known about the Colliers’ married life, except that the couple had eight children. Their first child, Elizabeth, was born in 1875, followed by George Washington Collier Jr., in 1876, and Lula V. in 1878. Virgil was born in 1882 and Roy in 1887. Two more children died as infants in 1880 and 1886. George Collier’s younger brother Andrew died in October 1887, and his children soon subdivided the family farm, which ranged along Peachtree Road for several hundred acres. In the summer of 1889, George Collier negotiated with the Atlanta and Charlotte Airline Railroad for right-of-way for a new railroad that would run through Land Lots 103 and 104 and sold a seven-acre swath to the railroad company in August for $3,750 acres. As a result of the railroad and its “whistle stop” service downtown, a suburban community began to grow at what would be called “Brookwood” in the twentieth century. In 1889, with an exposition underway at Piedmont Park, Lesbia Ann Collier died giving birth to an eighth, still-born child. She was thirty-three years old. Mother and child were buried together, probably first in the family cemetery then later reinterred at Westview Cemetery along with other family members. George Collier was almost seventy-six when she died, leaving him with five children, the youngest, Roy (1887–1965), not yet two years old. His oldest child, Elizabeth (1875–1926), was nearly fifteen and apparently took much of the responsibility for raising her younger sister and brothers. Atlanta’s population reached 65,000 by 1890 and downtown was booming. The city’s first electric street car lines were in operation, and Joel Hurt was beginning construction of the city’s first skyscraper. In addition to his property at Five Points, Collier had bought a large lot at the southeast corner of Peachtree Street and Ellis Street before 1868. After his wife died, Collier’s desire to insure a steady income for his children may have been a factor in his decision to embark on his most ambitious business venture— construction of a hotel on his vacant Peachtree Street lot. Running back to what was then Ivy Street, now Peachtree Center Boulevard, it was part of one of Atlanta’s most prestigious neighborhoods, especially after the Governor’s Mansion was located a block to the north in 1869. With the city’s main hotels clustered around Union Station, several blocks to the south, some thought a hotel that far uptown was bound to fail, but when his new Aragon Hotel opened in November 1892, it was an instant success. Six stories high, with four hydraulic elevators, the 125-room hotel catered to an up-scale clientele anxious to escape the noise and dirt around the railroad. Although the Kimball House near the railroads remained one of the city’s best hotels, the Aragon began a trend of hotels “uptown” away from the railroad corridor. It also gave a generation of the Collier family a steady income until it was closed and torn down in 1930. Civic improvements for the Cotton States and International Exposition at Piedmont Park in 1895 increased the demand for residential property in North Atlanta, and many of Collier’s neighbors were cashing in on that demand. Collier was loathe to do so, however, refusing offers of the then-fabulous sum of $1,000 an acre during the speculative real estate frenzy surrounding the expositions at Piedmont Park. He consented to sell a lot at Fifteenth and Peachtree to his niece and her husband Dr. Floyd McRae, Jr., and, in 1896, donated another lot near Fifteenth and Piedmont for the headquarters of the Daughters of the American Revolution’s “Craiggie House.” The rest was not for sale, since his downtown real estate was producing a good income for him and his children. George Washington Collier died at his home above Clear Creek on 19 June 1903, not quite ninety years of age. H. M. Patterson was in charge of the funeral, which was held from Collier’s house; he was laid to rest in Westview Cemetery. All of the city’s newspapers ran extensive obituaries for one of its oldest citizens, famous for having witnessed first hand the birth of the city. The old road that ran west of the Collier’s house toward Whitehall was an early route of Peachtree Road and remained a public road until after the Civil War. By the 1890s, it was little more than a driveway to Collier’s house. When Ansley Park was laid out, the developers planned to connect Collier’s drive to The Prado through a short street they called Collier Street. 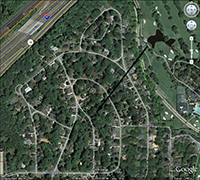 To the west of this street lay a large ravine, encompassed by a substantial lot along the north side of the intersection of The Prado and Peachtree Circle. In 1929, the lot remained undeveloped, and if Collier Street was ever built, it no longer existed by that time. 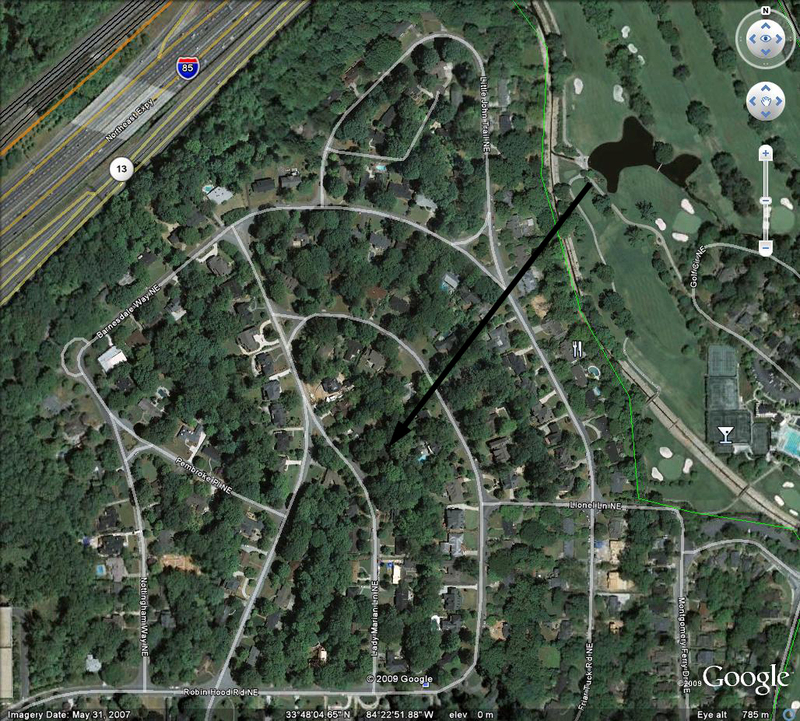 Instead, the Collier’s driveway meandered away from Peachtree Circle on the west side of the ravine. The family’s home lot, 104, remained in their control, as did the Aragon Hotel, the old building at Five Points, and other commercial buildings that their father had owned all over downtown Atlanta. In December 1905, Collier’s daughter Elizabeth married Henry Dodd (1871–1947); they would have two daughters, Elizabeth and Mary. George Collier Jr., who did not marry, died in 1910, the same year that the city limits were extended to create the Tenth Ward, which included much of the Colliers’ property. Roy Collier married Mildred Spratling (1890–1970) and moved away around the same time, leaving Virgil and Lula, who also did not marry, living in the old family home, which then had an address of 55 Peachtree Circle. In 1913, they had the graves of Meredith and Elizabeth Collier relocated from the old family cemetery to Westview Cemetery, but it is not clear that they moved away from the house at that time. By 1920, however, Elizabeth Collier Dodd divorced her husband, and she and her daughters were living with Virgil and Lula on Seventeenth Street. Elizabeth died in 1926, and by 1930, the two girls as well as Virgil and Lula Collier were, oddly enough, living with Elizabeth’s ex-husband, Harry Dodd, in Piedmont Heights. That was likely to have been a temporary arrangement, however, and Virgil and his Lula may have been living in the old Collier house when Virgil died in 1939. As for their father’s “country property” and the old home place, his children never launched the sort of development schemes that created Ansley Park on part of the family farm in 1904, Haynes Manor on their uncle Wesley Collier’s old farm in 1909, and Peachtree Heights and other developments on uncle Andrew Jackson Collier’s old estate in the 1910s and 1920s. In 1929, the Colliers’ property encompassed five hundred acres that lay mostly inside the city limits after 1925, and it remained almost completely undeveloped except for the Airline Railway right-of-way that bisected the property north of George Collier’s old house. In 1931, an extension of West Peachtree Street was laid out along the west line of Land Lot 104, and Beverly Road was laid out along the south line of the land lot. In spite of the Depression, a few houses were built along Beverly Road in the late 1930s, but most of the rest of “Collier’s Woods” remained undeveloped at the end of World War II. Planning for a system of expressways through the city was completed in 1946, and acquisition of rights-of-way and construction of the South Expressway began the following year . By 1951, ten miles of the system were complete, and land acquisition for the 3.4-mile-long northeast leg of the system began in July 1951. With the road passing through the northwest side of Land Lot 104, crossing and paralleling the railroad corridor that was created in the late 1880s, access to both rail and expressway transportation made the Colliers’ property in Land Lot 103 especially valuable for wholesale and warehouse operations. In the mid-1950s, the Armour-Ottley Industrial Park and other industrial areas emerged on the rich farm land in Land Lot 103 east of Clear Creek. In 1946, the Collier family finally sold their interests in Land Lot 104 to Hass & Dodd, a partnership that included Fair Dodd, who was Henry Dodd's brother, Herman J. Haas, L. Engle Mock, Judson W. Garner, Charles A. Meriwether, Edwin R. Haas, Jr., and Elliot L. Haas. By summer 1948, Haas & Dodd had laid out streets and subdivided Collier's Woods. The new development occurred on what was then one of the largest pieces of undeveloped property inside the city limits. 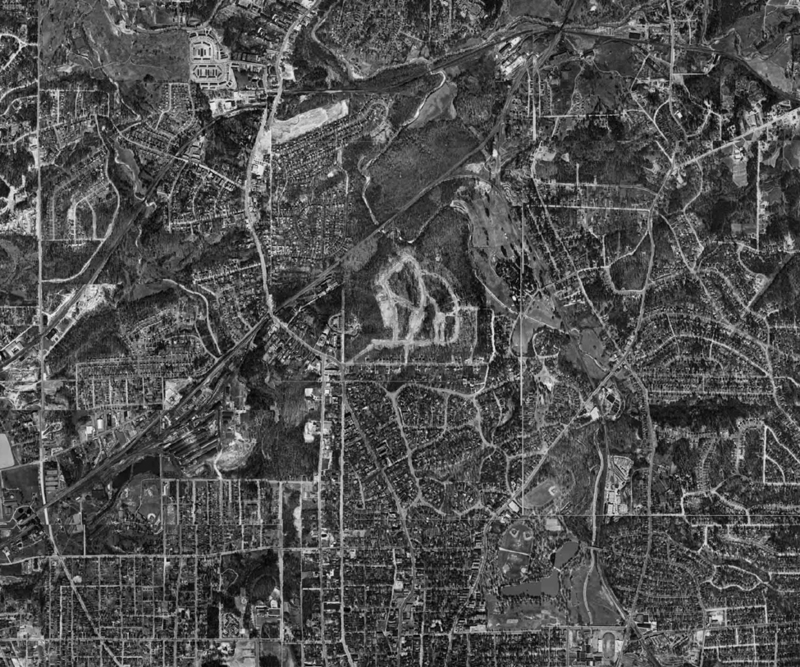 The city limits would not be expanded north of Twenty-fifth Street until 1952, but well before World War II, residential development continued all the way to Buckhead, except for Collier’s Woods north of Beverly Road. 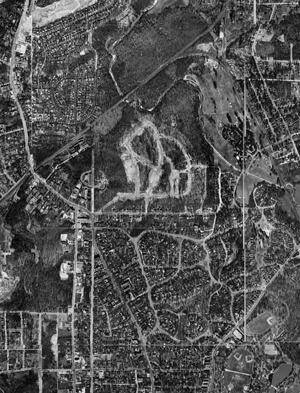 In addition, commercial development along the Peachtree Street corridor resumed after World War II, with the proposed interchange where the new expressway would cross Peachtree at Brookwood sparking a spate of commercial development west of Collier’s Woods in the 1950s. Before 1948, the Atlanta Journal acquired several acres in Land Lot 104 east of the extension of West Peachtree Street, but the land remained undeveloped until WSB built its television headquarters and studios, “White Columns,” on the site in 1955. As late as the 1990s, there were reports of the remains of Civil War entrenchments in the hillside overlooking the freeway and the culverted remains of Clear Creek in Land Lot 104. Kennon Perry was born in Bulloch County, Alabama, and educated at Alabama A&M, the predecessor of Auburn University. He married Wyolene Lowe Purtell in 1915, but the couple apparently remained childless. He is reported to have designed Trinity Episcopal Church, constructed in 1909 in Union Springs, Alabama, while he was still in high school. After service in World War I, he and his wife moved to Atlanta, where they lived on Sutherland Terrace in Kirkwood. He worked for Robert and Company and, with them, is credited with Gunby Jordan’s great Tudor Revival mansion (1921) at Green Island Ranch, a National Register property in Muscogee County, Georgia. In the 1920s, he designed a number of residences in Newnan’s Platinum Point and Jackson Street National Register Districts as well as the Newnan Hospital. By 1930, he was living in Ansley Park in Atlanta and had established an independent practice. In 1939, he provided the Art Deco design for Newnan’s Municipal Auditorium, the “most modernistic” building in the city at that time. The following year, he supervised construction of the Academy of Medicine in Atlanta, although Philip Shutze is credited with the building’s design. erms of the sale required that the house be moved to conform to the established building setback line and “to remodel the residence to conform to all restrictions of the subdivision” or it was to be demolished. The developers offered a $750 rebate if the house were demolished, and Perry is reported to have bought the property intending to do just that. On closer inspection, Perry found Collier’s old house to be sound and decided to preserve and restore it instead. In a city where it had always been easy to assert that Sherman had burned everything of historical interest, the vestiges of the past were easily dismissed. Perry’s decision to preserve and rehabilitate the Collier house was very unusual for the time. Although the deed required that Kennon commence work on the house by 1 April 1950, a building permit was not issued until 26 July 1951, and not marked complete until 23 September 1952. Kennon was keenly aware of the historical significance of the house and, with strong support from his neighbors, he was able to avoid moving the house, as the deed had required. He completely renovated the structure and built a large addition at the rear of the house, nearly doubling its size. Perry designed the addition to take advantage of the original structure’s site at the crest of the hill, and using hip and shed roofs was able to minimize the visual impact of the new work. Small windows were added on the front of the second floor where there had been none; the front porch, which had lost much of its woodwork, was reconstructed. The floor plan and some of the interior finishes in the original part of the house remained intact, including, the original mantles, much of the original beaded base board, most of the original 5"-wide, tongue-and-groove, pine flooring, the Italianate newel post and balustrade on the main staircase, and at least some of the plaster walls. Collier’s old stone chimneys, fireplaces, and cellar; the walnuts in the backyard; and the old smokehouse survived as well. Bentley was born 15 June 1927, in Upson County in middle Georgia and grew up on land which his ancestors had farmed since the 1830s. Graduating from the Robert E. Lee Institute in Thomaston in 1944, he served in the Naval Air Corps in 1945 and 1946. He enrolled in the University of Georgia’s law school in 1947 and was already keenly interested in politics. His father had been both state representative and state senator and was a part of the so-called Dixiecrat rebellion at the Democratic Convention in 1948. During Herman Talmadge’s successful campaign for governor that same year, Bentley was a vocal Talmadge supporter and organized student support at Talmadge rallies all over northeast Georgia. Renting a bus and a keg of beer, he would ferry students to Talmadge’s campaign stops in nearby towns, and they ultimately attracted Talmadge’s attention. On one of his swings through Athens, Talmadge stopped off to see Bentley, thank him for his support, and tell him to keep in touch. After receiving his law degree in 1950, Bentley began working as an aide in the Governor’s Office in Atlanta. The following year, at the age of 23, he was appointed Talmadge’s executive secretary and served in that position through both of Talmadge’s two terms as governor. Bentley was president of the Georgia Railroad Association from 1955 until his election as the state’s comptroller general in 1962, a post he held until 1971. During that time he was president of the National Association of Insurance Commissioners and led a reorganization that strengthened its regulatory authority. Generally recognized as progressive and effective in his role as insurance commissioner, Bentley is widely remembered for his decision in 1968 to switch his affiliation to the Republican Party. He and four other Democrats who also switched joined a push to create a viable second party in a state that had been totally dominated by the Democratic Party since the 1870s. Bentley launched a campaign for Governor in 1970 but was defeated by Hal Suit in the Republican primary. Neither he nor any of the “Wiregrass Mafia” who helped re-energize the state’s moribund Republican party were ever elected to public office again. Although Republicans would not began to succeed in Georgia until the 1980s, Bentley and his companions paved the way. In the early 1950s, Bentley was a frequent visitor to the Governor’s Mansion, which was then on The Prado in Ansley Park. He had driven around Sherwood Forest, then in the early stages of development, and seen the old Collier house, its windows covered with plywood. He even toyed with the idea of buying it and renovating it himself, as Governor and Mrs. Talmadge had done with the rambling Greek Revival house in Lovejoy that his father, Eugene Talmadge, gave them for a wedding present in 1946. While the Bentleys, then newlyweds, were not up to that challenge, when the house, which by then had been completely renovated, came up for sale in 1958, it did not take long for them to decide to buy. They also purchased the lot to the north, which in photographs from the period appears to contain the trace of old Montgomery Ferry Road. The Bentleys made few changes to the house beyond hiring noted interior decorator Edward Kilby, who worked with them for many years. Playing off their love of history, the Bentleys papered the back hall with facsimile copies of antique maps of Georgia and the Southeast and acquired a variety of antiques to fill the house. In 1972 they removed some walls to combine Perry’s kitchen and breakfast room into a single large kitchen, and around the same time, they added central air conditioning, which the house had not had up until that time. An accomplished cook, Bentley was especially noted for the elaborate barbecues that he staged for political events, family, and friends. Many of these, which always included his 16-ingredient Brunswick stew and barbecue sauce made from a 200-year-old family recipe, were held at his house on Lady Marion Lane. James L. Bentley Jr., died on 7 November 2003. 2. Meredith Collier had a twin brother, Merrill Collier, who settled in what is now south DeKalb County, GA.
3. The minutes of the Inferior Court were the only documents salvaged from the DeKalb County Courthouse when it burned in 1842. See the 1821 plat of survey for the 17th district, State Archives, for the route of the Standing Peachtree-Stone Mountain trail. The succeeding road is first depicted in some of the maps made by the Union Army in 1864, by which time large sections of it had fallent into dis-use. 4. See Atlas of the Civil War. 5. “Wash Collier’s Gift,” Atlanta Journal, 21 January 1896; Robert Adamson, “Wash Collier: As Sketched Amid His Quaint Home Surroundings,” Atlanta Constitution, 25 April 1897. 6. The house is documented by the Ruger map of the Atlanta Campaign. It was located around the present intersection of Peachtree Street and Beverly Road. George Collier is listed alone in the 1860 census of Fulton County. 7. Fulton County Deed Book BB, 417. 8. 1860 Federal Census, Fulton County, City of Atlanta, p. 186, 1240/1343; “Wash Collier’s Gift,” Atlanta Journal, 21 January 1896. 9. Alice Smythe McCabe, editor. Gwinnett County, Georgia, Families, 1818–1968. (Gwinnett Historical Society, Inc., 1988), 342. 10. George Collier apparently missed enumeration in the 1870 census. 11. Collier operated a sawmill not far from his house, and it is quite possible that he milled the lumber for his house from trees cut on his own property. If so, it might be possible to date the house’s construction through dendrochronological testing. 12. Franklin Garrett, Atlanta and Environs (University of Georgia Press, 1954), Vol. I, 654. 13. Atlanta City Directories; the building can be identified in a number of early photographs of Five Points. 14. Fulton County Deed Book UU, 274. 15. Fulton County Deed Book SS, 603-604. 16. Fulton County, Marriage Book D, 140. 17. George Collier’s obituaries indicate her maiden name was Neighbors; other sources suggest Corbit or Corput. The maiden name “Cornet” used in the marriage license is used here. The marriage license records her first name as “Eliby,” while the census taker in 1880 used “E. A.” The name “Lesbia Ann” inscribed on her grave marker at Westview Cemetery must be correct and that is what is used here. 18. Garrett, Vol. II, 138. 19. Fulton County Deed Book MM, 551. 20. Dates are taken from the grave markers in the family plot at Westview Cemetery. 21. Fulton County Will Book D, 231. 22. Fulton County Estate File #1150. 23. Garrett, Vol. II, 456–457. 24. Garrett, Vol. I, 438; II, 938. 25. Fulton County Deed Book 2453, 455. 26. Atlanta Constitution, 29 August 1948. 27. Fulton County Deed Book 2446, 355. 28. Fulton County Deed Book 3349, 354. Collier, Dwight A. “The Chinaberry Tree Chronicles (A Collier Genealogy).” Copy at the Atlanta History Center, furnishes genealogical information for the family and also includes memoirs and other research by earlier generations of the family. Perry, R. Kennon. “House for Mr. and Mrs. R. Kennon Perry, Sherwood Forest, Atlanta, Georgia.” Five sheets dated August 20, 1951. DeKalb County, Minutes of Inferior Court, 1822-1842, salvaged from the DeKalb County Courthouse when it burned, documents details of Meredith Collier’s early settlement and civic involvement in the county. Fulton County Marriage and Death Records, which include G. W. Collier’s marriage license, his will, an inventory of his estate in 1903, and subsequent annual returns. Fulton County, Record of Deeds and Mortgages, 1854–1950, includes record of Meredith Collier’s gift of Land Lot 104 to G. W. Collier in 1851 and subsequent chain of title to the property. Westview Cemetery. Record of Interments. Adamson, Robert. “Wash Collier: As Sketched Amid His Quaint Home Surrounding,” Atlanta Constitution, 25 April 1897. Garrett, Franklin. Atlanta and Environs. Athens GA: University of Georgia Press, 1954. McCabe, Alice Smythe, editor. Gwinnett County, Georgia, Families, 1818–1968. Lawrenceville, GA. Gwinnett Historical Society, Inc. 1988. Unknown author. “Wash Collier’s Gift,” Atlanta Journal. 21 January 1896. Unknown author. “Wash Collier’s House Must Go,” Atlanta Constitution, 29 August 1948.